Aeration is an essential step in lawn care because it helps to maintain a healthy lawn that can withstand drought and disease. removes apple core size plugs of topsoil. Hollow tines are useful if the thatch layer is very thick. 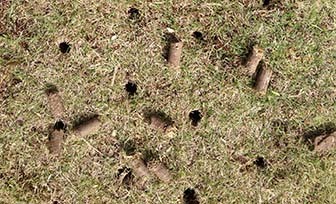 The hollow tined plugs break down and act as a top dressing thus recycling this material back into the lawn and helps break down any thatch. This process refreshes and enlivens the root zone helping to create a vibrant and healthy growing medium. Solid tines puncture the surface leaving a finer hole than solid tine. If your lawn is already in reasonable condition this is an excellent option. It leave little mess and the result are almost equal to hollow tine. If you have dogs then this will save muddy feet! Golf courses are wonderful examples of aeration in action. 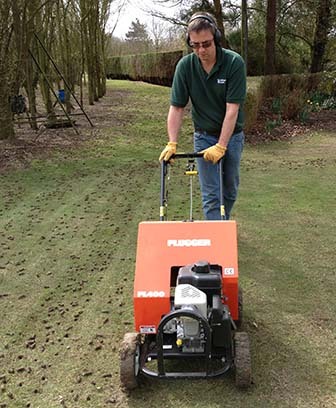 Tees, greens and fairways are regularly aerated by groundsmen and that is how they are able to create a healthy, hard-wearing sward.